NOTE: Every claimed source needs a cross-reference link; claimed sources need to be plausible, not awfully obscure; default costumes usually don't need descriptions since they are not alternate costumes; returning costumes original to Smash do not need references to their appearances in previous Smash games. Each character in Super Smash Bros. 4 has a set of alternate costumes. Due to the presence of 8-Player Smash, all characters now have eight costumes (except for Little Mac, who has 16). Some costumes have slight visual differences between the 3DS and Wii U versions. Some characters possess certain alternate costumes with more drastic design differences, and are not merely recolors of their standard outfits. Wario, Zero Suit Samus, Little Mac, Shulk, Cloud and Bayonetta have different outfits available; Villager, Wii Fit Trainer, Robin and Corrin all have male and female variants; Olimar and Bowser Jr. have model swaps that change them into new characters, complete with corresponding voice and Announcer clips, though like all other alternate costumes, they bear no gameplay differences. Team Battles no longer confine characters to using their respective team color schemes, as teams are now indicated by colored outlines around the characters, giving players the freedom to pick whichever alternate costume they want to use in Team Battles. On the Find Mii stage in Super Smash Bros. for Nintendo 3DS, the Dark Emperor uses magic that affects all players of the same color. Each alternate costume is allocated to one of the twelve Mii colors: black, brown, red, orange, yellow, light green, green, light blue, blue, purple, pink, and white. These colors are noted in the below lists as a bar underneath the corresponding portrait; as several characters have multiple costumes that share this color, the main color names as used on this page do not conform to this system. Half of Bayonetta's costumes are based on her design from Bayonetta 2, while the other half are based on her design from Bayonetta. For the former half, she wields Love is Blue, which has blue attack trails. For the latter half, she wields Scarborough Fair, which has red attack trails, and speaks English even in the Japanese version. Based on her appearance in Bayonetta 2. Based on Jeanne, Bayonetta's friendly rival. The hair visible in her Wicked Weaves and on Gomorrah is also colored white. Based on her appearance in Bayonetta. Resembles her green alternate color in Anarchy Reigns. Resembles her blue alternate color in Anarchy Reigns. Giga Bowser is always treated as yellow in Find Mii. Resembles one of his alternate colors in Mario Golf and his in-game sprite from Super Mario World. Resembles Morton's in-game sprite from Super Mario Bros. 3 and in-game sprite from Super Mario World. Resembles one of his alternate colors in Mario Golf and his in-game sprite from the NES version of Mario is Missing!. Based on Blue Bowser's in-game sprite in Super Mario Bros.: The Lost Levels. It also resembles one of his alternate colors from Mario Golf. Bowser Jr.'s alternate costumes replace him with each of the seven Koopalings. Bowser Jr. rides the Junior Clown Car which was introduced in New Super Mario Bros. Wii, whereas the Koopalings ride in a mass-produced Koopa Clown Car with a design unique to the Super Smash Bros..
Bowser Jr. rides in his Junior Clown Car that was introduced in New Super Mario Bros. Wii. Replaced with Wendy O. Koopa. Replaced with Morton Koopa Jr. Replaced with Ludwig von Koopa. Based on Blood Falcon, Captain Falcon's clone and rival. The logo on his back changes to a skull with "Blood Hawk" (the name of Blood Falcon's vehicle) written underneath. Resembles his appearance in the original F-Zero and his appearance in F-Zero: GP Legend. Resembles Jody Summer's original design in F-Zero X. Resembles the Pokémon Charmeleon, the pre-evolved form of Charizard. Resembles the Shiny colorations of Charmander and Charmeleon, the other members of Charizard's evolutionary family. Resembles the Pokémon Zubat and its evolved form Golbat. Resembles its original Shiny coloration from Pokémon Gold, Silver, and Crystal. Half of Cloud's costumes are based on his appearance in Final Fantasy VII, while the other half are based on his "Cloudy Wolf" design from Final Fantasy VII: Advent Children. In two of his Advent Childen costumes, his Geostigma-infected arm is covered by a sleeve, while it is exposed in the other two, revealing the red ribbon he wrapped around it in memory of Aerith Gainsborough. His costumes with the exposed arm are based on his appearance in Advent Children after his fight with Bahamut SIN, during which his sleeve is torn off. He wields the Buster Sword in the former outfits and the Fusion Swords in the latter outfits. Based on his appearance in Final Fantasy VII. Based on his appearance in the movie Final Fantasy VII: Advent Children. Resembles Zack Fair, Cloud's best friend, in his 2nd-Class SOLDIER uniform from Crisis Core: Final Fantasy VII. Resembles the 3rd-Class SOLDIER uniform from Crisis Core: Final Fantasy VII. Resembles the 2nd-Class SOLDIER uniform from Final Fantasy VII. Based on his appearance in Final Fantasy VII: Advent Children after his fight with Bahamut SIN, during which his sleeve is torn off. Resembles his appearance in Final Fantasy VII Remake and Zack Fair's 1st-Class SOLDIER uniform in Crisis Core: Final Fantasy VII. Half of Corrin's costumes are male, while the other half are female. Based on the default customization settings for the Nohr Prince in Fire Emblem Fates. Based on the default customization settings for the Nohr Princess in Fire Emblem Fates. Resembles her appearance as a Nohr Noble in Fire Emblem Fates. Resembles Magnus from Kid Icarus: Uprising. Resembles Pit. Dark Pit retains his black wings and gains a red scarf, likely to better differentiate the two. It is complementary to Pit's "fallen angel" costume. His vest is reminiscent of his alternate outfit in Donkey Kong Country's Two-Player Contest mode. Resembles one of his alternate costumes from Donkey Kong 64's Multiplayer Mode. Resembles Kiddy Kong, Dixie's partner in Donkey Kong Country 3: Dixie Kong's Double Trouble. Fur color resembles a gorilla. His tie is reminiscent of Donkey Kong's appearance in Donkey Kong Country's Two-Player Contest Mode. Fur color resembles the in-game sprite of Donkey Kong from the original Donkey Kong. Resembles one of his alternate colors in DK: King of Swing's Jungle Jam mode. Referred to as "Yeti DK" on the Brawl DOJO!!. Also resembles the Fire Mini Donkey Kongs from the Mario vs. Donkey Kong. Fur color resembles one of his alternate colors from Mario Golf. Fur color resembles Junior (II) from Donkey Kong Jr. Math. Resembles his appearance in Dr. Mario 64, but with black jeans instead of white trousers. Referred to as the "Unlicensed Doctor" on the Melee website. Duck Hunt's alternate costumes change the dog and/or the duck's colors to resemble real variants of the respective animals. The duck is one of the three possible ducks from Duck Hunt. The dog has a tricolor coat pattern. The duck resembles a male Saxony duck. The dog has the bicolor coat pattern of a Border Collie. The duck resembles an American black duck. The duck resembles a female Orpington duck. The dog resembles a Dalmatian. The duck resembles a ruddy shelduck, an orange species with green wings. The dog resembles a Beagle. The duck resembles a male blue-headed mallard, an uncommon variant. The duck is one of the three possible ducks that appear in Duck Hunt. It resembles a male mallard. The dog resembles a black Labrador Retriever. The duck is one of the three possible ducks from Duck Hunt. Reminiscent of his appearance in Star Fox 64 and Star Fox 64 3D, but with the orange of his pants also applied to his jacket. Resembles his appearance in Star Fox: Assault. Complementary to Fox's "Dark Fox" costume. Reminiscent of a black pheasant or raven. Referred to as the "Dark Fox" on the Brawl DOJO!! It resembles a silver fox. Resembles his Player 1 costume from Star Fox: Assault's Versus Mode. The reticle is orange in Super Smash Bros. for Wii U instead of green. Resembles Fox's Player 3 costume from Star Fox: Assault's Versus Mode. Resembles Wolf O'Donnell, Fox's rival. Resembles his appearance as the monster Ganon in the original The Legend of Zelda, A Link to the Past, and A Link Between Worlds. Based on his appearance as a Hero in Fire Emblem: Radiant Dawn. Resembles Sigurd, one of the protagonists in Fire Emblem: Genealogy of the Holy War. Resembles Geoffrey, one of Ike's comrades, as he appears in Fire Emblem: Path of Radiance. Referred to as an "ordinary soldier" on the Brawl DOJO!!. Resembles the Black Knight, Ike's rival, as he appears in Radiant Dawn. 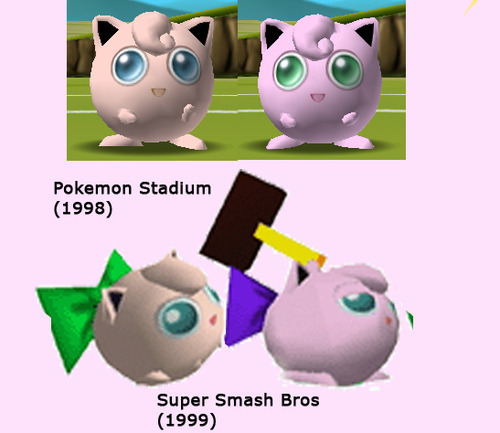 Unlike previous games, none of Jigglypuff's alternate costumes change it to its Shiny coloration. Its hat resembles Leaf's hat in Pokémon FireRed and LeafGreen, who is the female player character of those games. Its coloration resembles one of the possible colors for a nicknamed Jigglypuff in Pokémon Stadium. Its hat has the same design as the Bug Catcher Trainer class in Pokémon FireRed and LeafGreen. Its coloration resembles one of the possible colors for a nicknamed Jigglypuff in Pokémon Stadium. Its cap resembles the cap that Sleep Kirby wears in Kirby Super Star and Kirby Super Star Ultra. Resembles its Red Team costume from the original Super Smash Bros.
Its hat resembles Pokémon Center Nurse's hat in Pokémon X and Y. Its cap and glasses resemble the clothing items Red Felt Hat and White Wide-Frame Glasses from Pokémon X and Y, which are part of Serena's default clothing as a player character in those games. The color of his hammer does not change between costumes. Resembles one of his alternate costumes in Kirby Air Ride. The obi features sprites of Waddle Dees on it. Resembles one of his alternate costumes in Kirby Air Ride. The obi is reminiscent of formal Japanese kimonos. The obi features the same icons as one of the menu schemes from Kirby 64: The Crystal Shards. Resembles his monochromatic in-game sprite in Kirby's Dream Land when played on a Game Boy. Resembles one of his alternate costumes in Kirby Air Ride and a great penguin. Based on and directly referred to as "Keeby" from Kirby's Dream Course. It also resembles Yellow Kirby from various Kirby titles and Beam Kirby in Kirby Super Star. The costume is brighter in Super Smash Bros. for Nintendo 3DS. Based on Ice Kirby in Kirby Super Star. It also resembles Blue Kirby from various Kirby titles. Based on Fire Kirby in Kirby Super Star. It also resembles Red Kirby from various Kirby titles. Resembles Green Kirby from various Kirby titles and Plasma Kirby in Kirby Super Star Ultra. Resembles Kirby's monochromatic in-game sprite from Kirby's Dream Land. Resembles his appearance after using Orange Spray Paint in Kirby & The Amazing Mirror and Kirby: Squeak Squad. Resembles Meta Knight unmasked. The costume is brighter in Super Smash Bros. for Nintendo 3DS. Based on the Goron Tunic from The Legend of Zelda: Ocarina of Time. Also resembles his tunic with the Red Ring equipped in the original The Legend of Zelda and Red Link from The Legend of Zelda: Four Swords and The Legend of Zelda: Four Swords Adventures. Based on the Zora Tunic from The Legend of Zelda: Ocarina of Time. It also resembles Blue Link from The Legend of Zelda: Four Swords and The Legend of Zelda: Four Swords Adventures. Resembles Purple Link from The Legend of Zelda: Four Swords and The Legend of Zelda: Four Swords Adventures and Link's purple-colored Blue Ring Tunic from Soulcalibur II. Resembles his appearance after utilizing the Great Fairy's Tears in The Legend of Zelda: Twilight Princess. 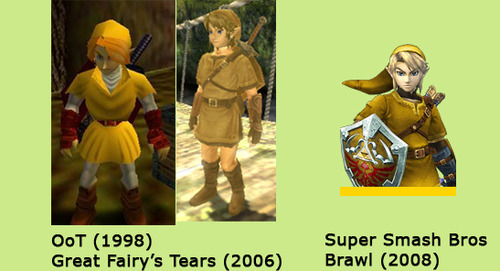 Also resembles an unused yellow tunic from The Legend of Zelda: Ocarina of Time. Based on Dark Link's appearance in The Legend of Zelda: Ocarina of Time. Based on his appearance as a resident of Skyloft from the beginning of The Legend of Zelda: Skyward Sword. Resembles Fierce Deity Link from The Legend of Zelda: Majora's Mask. The chain mail is more golden and the scabbard is darker in Super Smash Bros. for Nintendo 3DS. Little Mac is the only character with 16 different costumes, having a wireframe variant of each of his eight standard costumes. The wireframe variants are based on the player's appearance in the original arcade Punch-Out!! His wireframe palette swaps have slightly brighter cel-shaded colors than their non-wireframe counterparts. Giga Mac is always treated as green in Find Mii. Based on his appearance in Punch-Out!! for Wii. 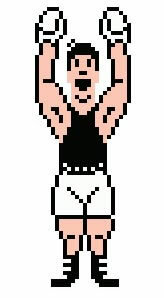 Resembles his appearance in the Title Defense Mode of Punch-Out!! for Wii. Resembles his in-game sprite after defeating opposing boxers in the NES version of Punch-Out!! and Piston Hondo's appearance in Punch-Out!! for Wii. Resembles his appearance when fighting in the World Circuit in Contender Mode of Punch-Out!! for Wii. Resembles his appearance when fighting in the Major Circuit in Punch-Out!! for Wii. Resembles his appearance as Player 2 in the multiplayer mode of Punch-Out!! for Wii. Resembles the protagonist of the SNES version of Super Punch-Out!!. His sweatshirt resembles the sweatshirt he wears in training montages in the Punch-Out!! series. The colors are inverted in the wireframe variant. Mega Lucario is always treated as blue in Find Mii. Resembles Riolu, its pre-evolved form. 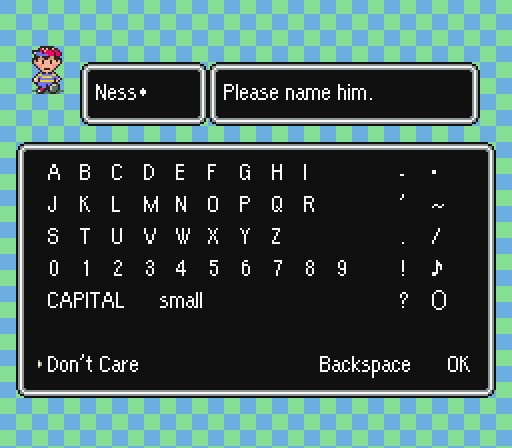 Resembles Claus, Lucas's twin brother from Mother 3. Resembles the Masked Man from Mother 3. The shirt features a sprite of the Masked Man's head. Resembles Duster from Mother 3. Resembles Boney's human disguise from Mother 3. The shirt's design features a sprite of Boney's head. The shirt's design features a sprite of a baby Drago from Mother 3. Lucina's alternate costumes are based on female characters from Fire Emblem Awakening. Resembles Tiki from Fire Emblem Awakening. The back of her cape features the crest of the Divine Dragon Naga, Tiki's mother. Resembles Tharja. The back of her cape features the Brand of the Fell Dragon, a prominent symbol in Tharja's home country. Resembles Mario's appearance on the North American boxart for Pinball, but with an orange cap. The original Super Smash Bros. website referred to this costume as "Strawberry Luigi". It resembles his appearance in Wrecking Crew. Resembles Mario's appearance on the North American boxart for Mario Bros. Resembles Waluigi, although the "L" on his cap is purple instead of yellow. This was not the case in Brawl. Resembles Mario's appearance on the boxart for the Donkey Kong Jr. Game & Watch and Luigi's appearance on artwork used for the vinyl cover of Mario no Daibouken and the boxart of All Night Nippon Super Mario Bros. The color contrast is more pronounced and vibrant in Super Smash Bros. for Nintendo 3DS, making it bear a resemblance to his appearance in the anime Super Mario Bros.: Peach-hime Kyushutsu Dai Sakusen!. Reminiscent of the colors of his outfit on the Japanese cover of the Famicom Mini (Game Boy Advance) port of Mario Bros. and the European cover of the NES version of Mario Bros.. These covers feature a faded version of the original Japanese cover of the Famicom version of Mario Bros..
Based on Wario's classic design. Unlike in previous Smash titles, the "M" on Mario's cap is green instead of blue. Originally based on Foreman Spike from Wrecking Crew, though the palette has become more monochromatic since its debut in the original Super Smash Bros. Resembles his appearance on the Japanese boxart for Wrecking Crew, but with the overalls being more brown and his hat being green. Also resembles Luigi's appearance from promotional artwork for the arcade version of Mario Bros., with the colors of the overalls and shirt swapped. Based on his appearance in Family Computer Golf: U.S. Course and NES Open Tournament Golf. Resembles Waluigi. It also resembles Mario's appearance with the L and W Emblems equipped in Paper Mario: The Thousand-Year Door. Based on his appearance as a Lord in Fire Emblem: Shadow Dragon and New Mystery of the Emblem: Heroes of Light and Shadow. The Falchion retains its design from Fire Emblem: Mystery of the Emblem. Resembles the overworld sprites of enemy units in the Fire Emblem games. Resembles the overworld sprites of allied units in the Fire Emblem games. Resembles his appearance in Fire Emblem: Mystery of the Emblem. Resembles Roy's yellow costume in Super Smash Bros. Melee, but with black pants instead of white. Resembles Roy's appearance in Super Smash Bros. Melee. Resembles his appearance when using Items 1, 2, and 3 in Mega Man 2. Resembles his appearance when using the Leaf Shield in Mega Man 2 and the Gyro Attack in Mega Man 5. Resembles his appearance when using the Metal Blade in Mega Man 2 and the Ring Boomerang in Mega Man 4. Resembles his Air Shooter appearance when using the Air Shooter in Mega Man 2 and the Jewel Satellite in Mega Man 9. Resembles his appearance when using the Slash Claw in Mega Man 7. Resembles his appearance when using the Flame Blast in Mega Man 6. Resembles his appearance when using the Thunder Beam in the original Mega Man, the Top Spin in Mega Man 3, and the Thunder Wool in Mega Man 10. Based on his regular appearance in the Kirby series, but with gauntlets over his gloves and a slightly different visor. Resembles his original appearance in Kirby's Adventure, but with red eyes. Resembles one of his alternate costumes in Kirby Air Ride and Kirby himself. Resembles Galacta Knight, Meta Knight's rival from Kirby Super Star Ultra. Resembles Dark Meta Knight, Meta Knight's rival from Kirby & The Amazing Mirror. Resembles one of the possible colors for Mewtwo in the Pokémon Stadium titles. Resembles Shadow Lugia from Pokémon XD: Gale of Darkness. The Mii Fighters' various costume options are distinct from how other characters' alternate costumes work. The colors of these costumes match the Mii's original color from the Mii Maker. In addition, the Mii's original color is used in Find Mii. To view the Mii Fighters' alternate costumes, see here. Reminiscent of characters and objects as depicted on the Virtual Boy. Reminiscent of the two shades commonly used by the Game Boy for the background and foreground. Reminiscent of the monochromatic LCD screen of the Game & Watch games. The shirt's pattern is reminiscent of Master Belch from EarthBound. The shirt's pattern is reminiscent of the tile pattern on the file select and character naming screens in EarthBound. Four of Olimar's costumes replace him with Alph, one of the protagonists of Pikmin 3. Based on his appearance in Pikmin 3. Combines elements of his white and blue costumes from Brawl, which resemebled a Navy Mark IV space suit and his partner Louie from Pikmin 2, respectively. Based on Alph's appearance in Pikmin 3. Resembles Charlie, Alph's captain in Pikmin 3. Resembles Brittany, Alph's co-worker in Pikmin 3. Based on his design in the Japanese version of Pac-Land, the Pac-Man World titles, and the Japanese arcade cabinets. Resembles his in-game sprite with the Wing Shoes power-up from Pac-Land. Resembles promotional artwork of his appearance with the Wing Shoes power-up from Pac-Land. His gloves and boots are reminiscent of oven mitts. Resembles her in-game sprite from the original Kid Icarus. Resembles Amazon Pandora from Kid Icarus: Uprising. Resembles her appearance in Kid Icarus's instruction booklet. Resembles Medusa as she appears in Kid Icarus: Uprising. Resembles Pauline's original appearance in Donkey Kong. Resembles one of her alternate colors from Mario Golf and Daisy's appearance on the title screen of NES Open Tournament Golf. Resembles one of her alternate colors from Mario Golf and her appearance on the title screen of NES Open Tournament Golf. Resembles a wedding gown. The dress is reminiscent of the wedding dress Paper Peach wore in Super Paper Mario. Resembles her in-game sprite from the original Super Mario Bros. and Fire Peach from Super Mario 3D World. 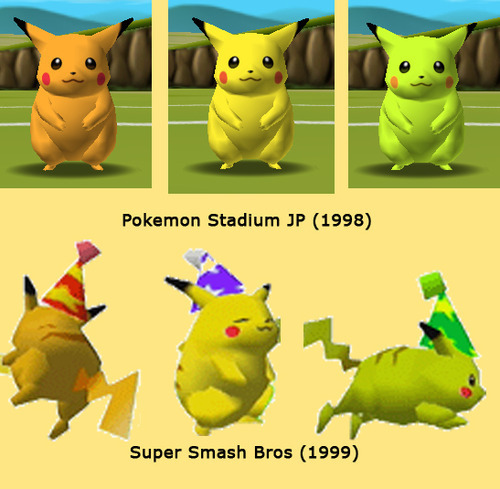 Its coloration resembles one of the possible colors for a nicknamed Pikachu in Pokémon Stadium and its Shiny coloration. Its cap is reminiscent of Red's appearance in Pokémon Red and Blue. Its coloration resembles one of the possible colors for a nicknamed Pikachu in Pokémon Stadium. Its headband resembles Brendan's headband in Pokémon Emerald. Its goggles are reminiscent of the Swimmer Trainer class and Pichu's Blue Team costume from Super Smash Bros. Melee. Its cap resembles Ethan's appearance in Pokémon HeartGold and SoulSilver. Resembles its Blue Team costume from the original Super Smash Bros.
Its coloration resembles its Shiny coloration. Its headband resembles the Choice Band. Its coloration resembles its appearance in Pokémon X and Y and its official artwork for the Pokémon series. Its cap and glasses resemble the clothing items Red Outdoors Cap and Wide-Frame Glasses from Pokémon X and Y, which are part of Calem's default clothing as a player character in those games. Based on his appearance in Kid Icarus: Uprising. Resembles his chiton after obtaining the Gold Arrow and reaching Level 4 strength in the original Kid Icarus. Resembles his chiton after obtaining the Bronze Arrow and reaching Level 2 strength in Kid Icarus. Resembles his chiton after obtaining the Sacred Arrow and reaching Level 5 strength in Kid Icarus. Referred to as a "fallen angel" on the Brawl DOJO!!. Unlike in Brawl, Pit retains his white wings and gains a purple scarf, likely to better differentiate him from Dark Pit. Resembles his chiton after obtaining the Silver Arrow and reaching Level 3 strength in Kid Icarus . Based on the Japanese version of R.O.B., the "Family Computer Robot", which was released as a peripheral for the Famicom. It is the default color for Japanese releases of Super Smash Bros. 4. Based on the Western version of R.O.B. released for the NES. The text on his base reads "R.O.B. - Robotic Operating Buddy" instead of "Family Computer Robot". 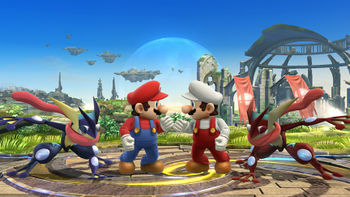 It is the default color for American and PAL releases of Super Smash Bros. 4, though some visual elements retain the Famicom color as primary. Resembles Flipper, a glitch enemy from Stack-Up. Also resembles the North American color scheme for the SNES. Resembles the Indigo Nintendo GameCube. Resembles the R.O.B. Launcher enemy from Super Smash Bros. Brawl's Subspace Emissary. Half of Robin's costumes are male, while the other half are female. Based on the default customization settings for the male player character in Fire Emblem Awakening. Based on the default customization settings for the female player character in Fire Emblem Awakening. Resembles the overworld sprite for Mark, the customizable tactician from Fire Emblem: The Blazing Blade. Resembles Anna, a recurring shopkeeper in the Fire Emblem series, as she appeared in Fire Emblem Awakening. Resembles Kris, the avatar from Fire Emblem: New Mystery of the Emblem: Heroes of Light and Shadow. Resembles Eyvel from Fire Emblem: Thracia 776. Resembles the White Mage class from Square Enix's Final Fantasy series. Resembles Serra from Fire Emblem: The Blazing Blade. With the exception of her default and purple costumes, Rosalina's alternate costumes are complementary to Peach's and transitively may share some sources of inspiration. Additionally, there are six different colors of Luma outlined here, although the colors are not tied to Rosalina's costume. Resembles Fire Rosalina from Super Mario 3D World. Based on his appearance in Fire Emblem: The Binding Blade and his appearance in Fire Emblem Awakening as an Einherjar, his design intended to make him appear more mature. Resembles the overworld sprites of enemy units in the Fire Emblem games. Roy can have this color scheme in Fire Emblem: The Binding Blade's Link Arena mode. Resembles the overworld sprites of allied units in the Fire Emblem games. Roy can have this color scheme in Fire Emblem: The Binding Blade's Link Arena mode. Resembles Marcus, Roy's guardian and ally in Fire Emblem: The Binding Blade. Resembles Eliwood, Roy's father, as he appears in Fire Emblem: The Blazing Blade. Resembles Zephiel, the main antagonist of Fire Emblem: The Binding Blade. Resembles Cecilia, Roy's tutor and ally in Fire Emblem: The Binding Blade. Seven of Ryu's costumes seem to derive from his alternate colors in Super Street Fighter II Turbo. Resembles his "Medium Punch" color ("Strong" in reference source) in Super Street Fighter II Turbo. Resembles his "Heavy Punch" color ("Fierce" in reference source) in Super Street Fighter II Turbo. Also resembles his appearance in the Street Fighter Alpha titles. Resembles his "Light Punch" color ("Jab" in reference source) in Super Street Fighter II Turbo. Resembles his "Light Kick" color ("Short" in reference source) in Super Street Fighter II Turbo. Also resembles Ryo Sakazaki, a fighter from SNK's Art of Fighting series. Resembles his "Medium Kick" color ("Forward" in reference source) in Super Street Fighter II Turbo. Resembles his "Heavy Kick" color ("Roundhouse" in reference source) in Super Street Fighter II Turbo. Resembles his "Start" color in Super Street Fighter II Turbo, but with a purple headband instead of a black one. Also resembles Dan Hibiki, another fighter from the Street Fighter series, who was originally intended to parody Ryo Sakazaki. Based on the Varia Suit as it appears in Metroid: Other M.
Based on the Fusion Suit from Metroid Fusion. Based on the Gravity Suit's in-game sprite from Super Metroid, but more closely resembles the color scheme of the Varia Suit of the original Metroid when missiles are selected. The original Super Smash Bros. website referred to this alternate costume as "mass-produced Samus", a reference to Gundam. Referred to as "Green Samus" by Masahiro Sakurai. While the artwork depicts the suit with an orange helmet and breastplate, they are red in-game. Based on the Light Suit from Metroid Prime 2: Echoes. Based on unused concept art of her from The Legend of Zelda: Twilight Princess. Resembles her appearance in The Legend of Zelda: Ocarina of Time. With the exception of his first and last alternate costumes, all of Shulk's costumes are based on the color schemes of his traveling companions from Xenoblade Chronicles. Based on his "Swimsuit" armor set and his appearance with weapons unequipped in Xenoblade Chronicles. His skin is slightly tanned when wearing this costume. His coloration resembles NiGHTS, a character from Sega's NiGHTS into Dreams series. His cuffs are reminiscent of the purple Chaos Emerald. His coloration resembles Classic Sonic from Sonic Generations. His cuffs are reminiscent of the Crystal Ring power-up from Sonic Adventure. His coloration resembles Silver the Hedgehog. His cuffs are reminiscent of the Ark of the Cosmos from Sonic Riders: Zero Gravity. His coloration resembles Dark Sonic, a brief transformation that appeared in the Sonic X anime. His cuffs are reminiscent of Silver's bracelets. His cuffs are reminiscent of the thumbs-up that appears in Knuckles the Echidna in Sonic the Hedgehog 2's Special Stage. His cuffs are reminiscent of the thumbs-up that appears in Sonic the Hedgehog 2's Special Stage, but orange instead of red. Based on his appearance in The Legend of Zelda: The Wind Waker. Resembles Red Link from The Legend of Zelda: Four Swords and The Legend of Zelda: Four Swords Adventures. Resembles Blue Link from The Legend of Zelda: Four Swords and The Legend of Zelda: Four Swords Adventures. Resembles Purple Link from The Legend of Zelda: Four Swords and The Legend of Zelda: Four Swords Adventures. Resembles Link's appearance in the original The Legend of Zelda. Resembles Dark Link's appearance in The Legend of Zelda: Ocarina of Time. Resembles Link's tunic with the Blue Ring equipped in the original The Legend of Zelda. Resembles Link's appearance in The Legend of Zelda: A Link to the Past and its sequel The Legend of Zelda: A Link Between Worlds. Villager's appearance varies greatly between costumes, with differing eyes, hair, gender and clothing. All of Villager's alternate costumes, with the exception of the yellow costume, are based on how the player may look at the start of a new game depending on how they answer questions asked by Kapp'n or Rover in Animal Crossing: Wild World and Animal Crossing: City Folk respectively. Male villager wearing a "No. 1 Shirt" as he appears in artwork for City Folk. Female villager wearing a "Daisy Shirt" as she appears in artwork for Wild World. Male villager wearing a "Racer 6 Tee". The corresponding starting appearance in Wild World and City Folk instead sports the "Paw Tee" and a different hairstyle. Female villager wearing a "Turnip Top". Male villager wearing a "Blue Tie-Dye Tee" as he appears in artwork for City Folk. Female villager wearing a "Rugby Tee". Male villager wearing a "Four-Ball Tee". Female villager wearing a "Yellow Bolero". Half of Wario's costumes use his biker outfit from the WarioWare series, while the other half use his classic outfit. Wario-Man is always treated as pink in Find Mii. Wario is the only character to have their number of costumes decrease from Super Smash Bros. Brawl, as he had 12 in Brawl and 8 in Super Smash Bros. 4. Combines elements of his red and black costumes from Super Smash Bros. Brawl. Combines elements of his yellow and green costumes from Super Smash Bros. Brawl. Resembles Mario's appearance in Donkey Kong and one of Wario's alternate colors in Mario Golf, but with his hat colored red instead of blue. Reminiscent of the colors of Mario's outfit on the Japanese cover of the Famicom Mini (Game Boy Advance) port of Mario Bros. and the European cover of the NES version of Mario Bros.. These covers feature a faded version of the original Japanese cover of the Famicom version of Mario Bros.. Resembles Mario's appearance on the Japanese boxart for Wrecking Crew, but with the overalls being more brown. Also resembles Luigi's appearance from promotional artwork for the arcade version of Mario Bros., with the colors of the overalls and shirt swapped. Half of the Wii Fit Trainer's costumes are female, while the other half are male. Resembles her appearance in Wii Fit, but with her hairstyle from Wii Fit Plus. Resembles his appearance in Wii Fit. Resembles her appearance in Wii Fit Plus and Wii Fit U. Resembles his appearance in Wii Fit Plus and Wii Fit U. The color of the tank top and waistband is reminiscent of the Aerobics category. The color of the suit is reminiscent of the Aerobics category. Resembles her outfit from Wii Fit Plus that appears during Yoga or Strength Training activity in My Wii Fit Plus mode. The color of the tank top and waistband is reminiscent of the Balance Games category. 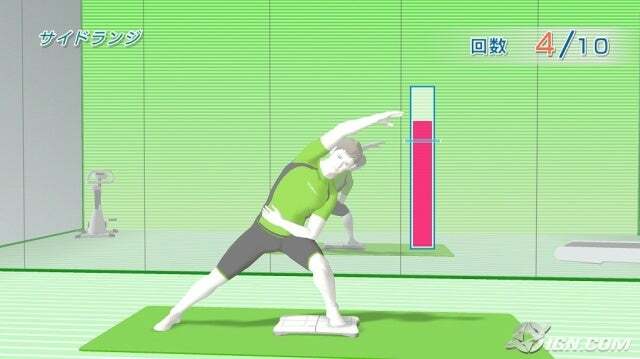 Resembles his outfit from Wii Fit Plus that appears during Yoga or Strength Training activity in My Wii Fit Plus mode. The color of the suit is reminiscent of the Balance Games category. Unlike in previous installments, the spots on Yoshi's Egg now match those of the selected costume. Based on a Green Yoshi. Based on a Red Yoshi. Based on a Blue Yoshi. Based on her appearance in The Legend of Zelda: Twilight Princess. Resembles the color scheme of her in-game sprite when Link rescues her with the Red Ring equipped in the original The Legend of Zelda. Resembles her in-game sprite when Link rescues her with the Blue Ring equipped in the original The Legend of Zelda. Based on Adult Zelda in The Legend of Zelda: Ocarina of Time. Resembles her in-game sprite when Link rescues her with no ring equipped in the original The Legend of Zelda. Resembles her appearance in The Legend of Zelda: A Link to the Past and its sequel The Legend of Zelda: A Link Between Worlds. Resembles a wedding gown. It also resembles her overworld sprite from The Legend of Zelda: A Link to the Past and her appearance as the goddess Hylia in The Legend of Zelda: Skyward Sword. Based on her appearance in Metroid: Other M and Metroid: Zero Mission. Resembles her Zero Suit at the end of Metroid Prime 2: Echoes. Resembles her leotard at the end of the original Metroid. Resembles her outfit from one of the endings of Metroid Fusion. Based on her outfit at the end of Metroid: Zero Mission. Based on her outfit at the end of Fusion. ↑ Super Smash Bros. for Wii U (North America) - Tip: "A Bowser Impostor?! – In Super Mario Bros.: The Lost Levels, Mario fights a blue fake Bowser before the real thing. That blue fake is his eighth color in this game!" ↑ Super Smash Bros. for Wii U (North America) - Palutena's Guidance: "I wonder if his father bought him that Junior Clown Car. It's decked out with all sorts of bells and whistles." ↑ Super Smash Bros. for Wii U (North America) - Palutena's Guidance: "That Koopa Clown Car is the mass-produced type." ↑ 16.0 16.1 Masked Man (translator) (2016-02-23). Nintendo Dream Interview with Sakurai: Part 2. SourceGaming. Retrieved on 2018-04-18. ↑ Super Smash Bros. for Wii U (North America) - Tip: "Zero Suit Samus's 7th Color – Zero Suit Samus's seventh color variation is a unique orange outfit. This outfit first appeared in certain endings of Metroid: Zero Mission." This page was last edited on April 19, 2019, at 11:01.